Washington became a state November 11, 1889, the 42nd state admitted to the Union. A territorial legislature convened here in 1854, when Olympia was capital of the land that eventually became the states of Oregon and Washington. Those were dangerous times – a 15-foot stockade surrounded the town because of Native American unrest. Later, that wall was dismantled and the lumber used to pave the streets. Olympia is surrounded by natural beauty, with Mt Rainier and the Olympic Mountains on its skyline and Puget Sound at its doorstep. 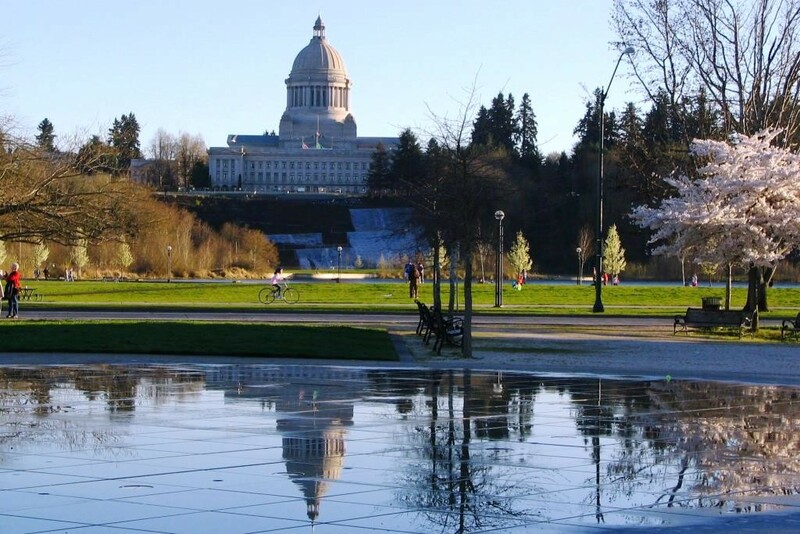 The elaborately detailed capitol, which has a 287-foot dome topped by a 47-foot lantern, sits in a 35-acre park overlooking Capitol Lake and Budd Inlet. On the grounds are Japanese cherry trees and many fountains. The rare Olympia oyster lives in beds nearby named Big Skookum, Little Skookum, Mud and Oyster. Tumwater Falls Park has trails along the Deschutes River; Olympic National Forest is 630,000 acres of rivers, ridges, peaks, canyons, and Douglas fir, with a large herd of Roosevelt elk. The coolness and the calm, the caring for community, the pride. The coffee cup, the pleasant walking paths, the waterfront, the boats to sail you anywhere. The daily sight of Mt Rainier. Mountains near: Cascade Mountains, Olympic Mountains. Mount Rainier in the southwest part of the state is the highest point in Washington at 14,411 feet.